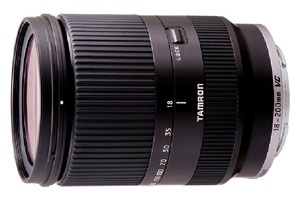 Today Tamron announced their first lens for mirrorless cameras - the 18-200mm f/3.5-6.3 Di III VC for Sony NEX system. You can download the PDF brochure here. The new lens will be available for sale in Japan on December 15th. Pricing was not announced at that point. December 8, 2011, Saitama, Japan – Tamron Co., Ltd. (President & CEO: Morio Ono; Headquarters: Saitama City), a leading manufacturer of optical equipment, announced the introduction of an exciting new lens, the 18-200mm F/3.5-6.3 Di III** VC (Model B011). The new high-power zoom lens is designed for the Sony E-mount system of its NEX series interchangeable-lens, lightweight and compact digital cameras. Sales in Japan will commence from December 15, 2011. The 18-200mm F/3.5-6.3 Di III VC (Model B011) (referred to below as 18-200mm Di III VC) is a high-power zoom lens, developed by zoom lens pioneer Tamron, for use with the E-mount system of Sony's NEX series compact interchangeable-lens cameras. 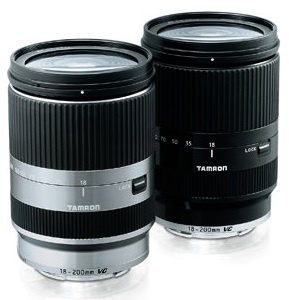 Tamron brings 19 years of high-power zoom lens development technologies to this product. Tamron has created a lens that is compact and lightweight, featuring a 62mm filter and weighing only 460g, at the same time delivering superlative image quality. This size allows users to easily enjoy shooting across the whole range - from wide-angle to full telephoto - with just one lens. Featuring a striking appearance befitting the NEX series design, the lens is available in silver and black. The AF drive has a stepping motor that is optimal for the Contrast-detection AF system employed by NEX series cameras. This has also enabled improvements in AF performance when shooting video. In addition, ease of operation is enhanced with the Direct Manual Focus (DMF) function, which allows the user to make fine manual adjustments after initially focusing by AF. The focal length coverage is 18-200mm. Converted to the coverage of a the 35mm format, this is equivalent to a range of 27mm wide-angle up to 300mm full telephoto. This allows the user to take wide-angle shots of expansive landscapes and powerful telephoto images that enlarge the details of distant subjects—all with one lens. In addition, by setting the lens at the telephoto end (200mm) and moving in to the minimum focus distance of 0.5m, flower petals, jewelry and other small objects can be shot as expanded close-ups. Equipped with Tamron's acclaimed VC (Vibration Compensation), and thanks to its light weight and compact size, this lens allows easy handheld shooting of sharp images with no camera shake over a wide range of settings, from everyday snapshots to memorable travel scenes. This entry was posted in Sony, Tamron. Bookmark the permalink. Trackbacks are closed, but you can post a comment.